Remembering Glenda L. Guenther | Remembering Glenda L. Guenther | De Soto Obituary Search | Dietrich-Mothershead Funeral Home, Inc. Remembering Glenda L. Guenther | De Soto Obituary Search | Dietrich-Mothershead Funeral Home, Inc.
Glenda Lois Guenther was born September 25, 1954 in East St. Louis, IL. She was the daughter of Alvin T. Bourbon, Sr. and Bernice (nee Boyer) Bourbon Hertweck. 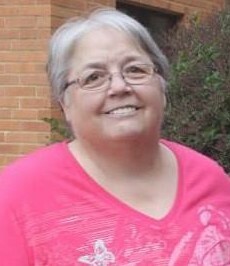 She passed on Monday, April 15, 2019 at Mercy Hospital Jefferson in Crystal City, MO at the age of 64 years. She is survived by her Mother, Bernice (nee Boyer) Bourbon Hertweck, Festus, MO; husband of 48 years John P. Guenther, Festus, MO; two daughters, Angie (Jeff) Merseal, Festus, MO and Anita (Heath) Sells, Peoria, IL; siblings, Alvin T. (Lynn) Bourbon, Jr., Granite City, IL; Kathy Sherman, Vichy, MO; and Vanessa (Paul) Smith, Norfork, AR; grandchildren, Natalie (Scott) Bolen, Brooke Merseal, Andrew Merseal, Hannah Sells, and Elijah Sells; and several nieces, nephews, and great nieces and nephews. She is preceded in death by her father; step-father, Greg Hertweck; and brother-in-law, Roger Sherman. Glenda was an office manager for The Salvation Army.